Many people are looking for love in their lives, not a superficial love, but a deeper meaningful love. We often refer to this love as a soul mate, someone with whom you have a deep soul connection with. Someone that cares deeply for you, understands you and loves you unconditionally. Sometimes in love you can be hurt, which can make it difficult to open yourself up again and be vulnerable. Finding your soul mate requires a leap of faith and risk, but will be worth the effort if this is what you wish and desire in your life. A soul mate is different to a twin flame, in which you usually don’t incarnate with, A soul mate is part of the same soul group, that you decide to learn and grow from together, through many lifetimes. You may have many soul mates in a lifetime, or just one that you share and spend the rest of your life with. You can also have great bonds and soul connections with animal souls throughout your life. The guided imagery meditations on this album were created to assist you in attracting a soul mate into your life. The meditations are spirit-inspired with visualizations, guided imagery and affirmations to help attract and magnetize a soul mate into your life. Feel free to listen to these meditations as often as you like – the more frequent that you listen to them, the stronger the effect and potential outcome. 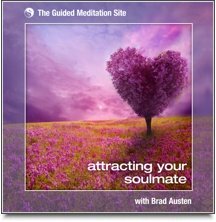 I sincerely hope these meditations assist you on your path to attracting a soul mate in your life. In this introduction I outline the concept of the soul mates album and how it can assist you in attracting a soul mate or partner into your life. Some advice is given to prepare for your meditation practice, followed by some breathing exercises to help slow down your mind and relax your body. In this meditation I guide you through a visualization to become clear in what you are seeking in a partner. I ask you to visualize their appearance and personality – so you can ultimately attract this perfect partner into your life. Some advice is given to prepare for your meditation practice, followed by some breathing exercises to slow down your mind and relax your body. In this meditation I guide you with guided imagery to a natural park setting where you have the opportunity to meet your soul mate. Your soul mate is happy to see you and you spend some quality time together - before attracting them into the physical.